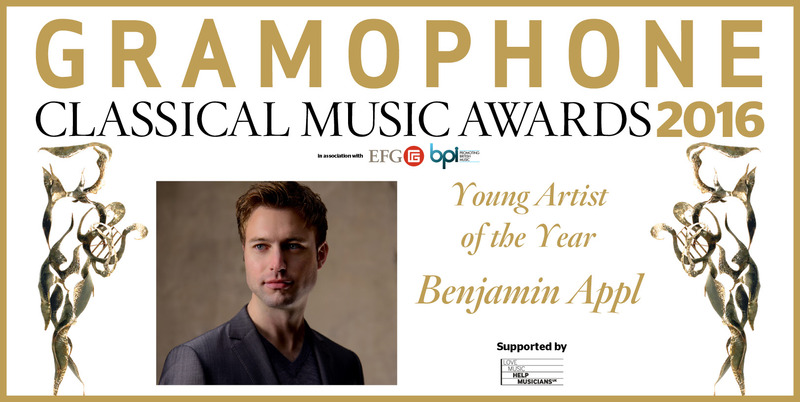 For the past few years, British music-lovers have been aware of a major new singing talent in their midst, Benjamin Appl. Listeners to BBC Radio 3 have had a particularly privileged ring-side seat as this young German baritone was a New Generation Artist for the class of 2014-16; but he’s an increasingly visible figure on the concert scene, and once seen – tall, blond, handsome and with a commanding stage presence – he’s not easily forgotten. The last private pupil of Dietrich Fischer-Dieskau (there’s a YouTube clip of the two baritones, nearly a half century apart in age, working on Lieder together), Appl has been named an ECHO Rising Star and, earlier this year, he signed a contract with Sony Classical, the first fruits of which will appear early next year. Appl has appeared on a number of recordings, often alongside other singers – in the Mendelssohn song series with the pianist Malcolm Martineau for Champs Hill or in songs by Schumann alongside Ann Murray for Linn (‘With clear, incisive diction, he characterises vividly in the narrative “Ballade des Harfners” and catches both the Lear-like weariness of soul and the accusatory bitterness of “Wer sich der Einsamkeit ergibt”, wrote Richard Wigmore in March last year). But 2016 saw the appearance of his first two solo recordings. If you are a library, university or other organisation that would be interested in an institutional subscription to Gramophone please click here for further information.